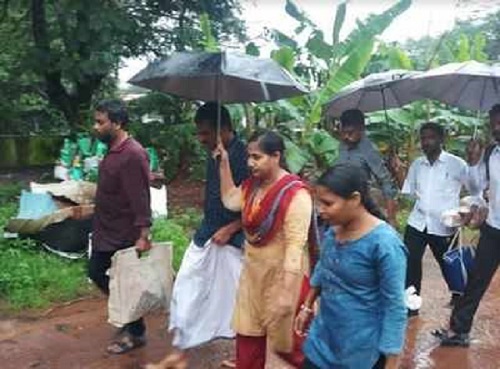 P A Shyna, who was arrested for Maoist activities in Karnataka, Kerala and Tamil Nadu in May 2015, has been released on bail.She was released from the womenʹs jail in Kannur at around 5pm on Tuesday. Shyna was recieved by human rights activists including C P Rasheed, Shanto Lal and others at the gate of jail. She was taken to the vehicle in a procession. Shyna said that all the 17 cases were slapped on her only because she stood with the people. "There is no evidence in the cases and the police framed the cases only to keep us in jail for three-and-a-half years," she said. Maoist movement in the Western Ghats. that police made clandestine moved to delay the release. Shyna was shifted to Kannur jail from Coimbatore jail on the last day. We doubt some foul play behind all these manuvers," said C P Raheed, leader of the Janakeeya Manushyavakasa Prasthanam.